Swaying underneath bright lights, Ricky Kendall holds the neck of his guitar with one hand and points into the crowd with the other. “Anyone out there with a big imagination?” he asks. A little girl in a big fluffy dress jumps into the air. “Me! Me!” Nearby, a toddler totes a plastic hoop that towers over her, and a young Spider-Man bounces her body to the beat, nearly missing her mouth with giant spoonfuls of ice cream. The audience for this concert, held Nov. 17 at Heartwood Soundstage just south of downtown Gainesville, is younger than usual for Kendall. That’s because it’s a celebration of Kendall’s latest release, “Thankful for Love,” an album co-written between 2013 and 2014 with pediatric patients at UF Health Shands Children’s Hospital. 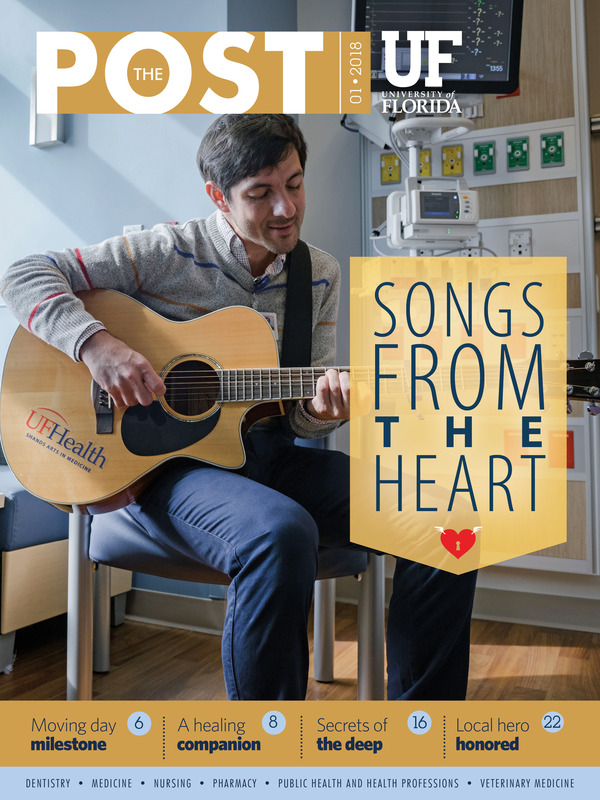 As an artist-in-residence with the UF Health Shands Arts in Medicine program, Kendall spends much of his time with patients of all ages performing tunes and creating music and visual art. This album, however, is so much more than a collection of songs. It’s an affirmation of the power of love in healing both body and soul. Many of the album tracks retain the upbeat melodies and relaxed rhythms omnipresent in children’s music, he said, but the lyrics go deeper than that. He hopes families going through tough periods of illness will listen to the songs together. Kendall hopes listeners gain a sense of the power of human connection that can occur within a health care setting. Kendall, who visited Brianna regularly in the pediatric ICU where she awaited a heart transplant, tried to steer the conversation toward something simpler. Kendall said this experience planted the seed that ultimately grew into the eight-song album “Thankful for Love,” and beyond. He began to work on songwriting more frequently with the young patients he visited, helping them translate their visual artwork into words and spending his evenings at home putting melodies to those words for the songs on the album. The songs on the album cover topics including your best stuffed animal friend, the arrival of a new baby brother, make believe, fighting for your life and staying positive. On “Girog,” Kendall outlines the entire life of a half-dog, half-giraffe stuffed animal. The co-writing was a give-and-take process. Sometimes Kendall would lift lyrics directly from the young peoples’ mouths. He’d often ask their opinion on the guitar tone to best match the mood of the lyrics. Kendall and arts therapist Amy Bucciarelli worked with Brianna to create both music and visual art. The album cover for “Thankful for Love” is an adult artist’s interpretation of a painting the pair worked with Brianna to create. In the original work, a red heart marked with a capital ‘T’ for trust sprouts a pair of golden wings. Brianna’s mother, Maria Medina, recalled her daughter’s inspiration. Before the album could be completed, Brianna passed away from complications of restrictive cardiomyopathy in 2014. Medina, who established Brianna’s H.O.P.E. Fund to support arts programming in medical settings, funded the creation of the album, which was produced with help from Tina Mullen, director of the UF Health Shands Arts in Medicine program, and Dave Melosh, who owns Heartwood Soundstage. Medina said she hopes the album’s listeners hear the creative force within Kendall’s young collaborators. Dealing with trauma at a tender age is not a foreign concept to Kendall, 36, who is from Stuart, Florida. He spent two and a half weeks in the hospital at age 6 after being injured in a car accident. A veteran Gainesville performer of 16 years whose previous release was the 2015 album “Passing Chord,” Kendall was brought onto the Arts in Medicine team by former artist-in-residence and musician Danielle DeCosmo. The program brings healing energy to patients in a unique, creative way that has nothing to do with beeping machines and scary procedures. Pediatric cardiologist Frederick Fricker, M.D., treated Brianna during her stay in UF Health Shands Children’s Hospital. He said he recommends all patients take advantage of the Arts in Medicine program offerings. Bucciarelli, who is now an instructor at UF’s Innovation Academy, built therapeutic relationships with patients, providing them with psychological support and introducing them to artists-in-residence such as Kendall when she believed they could benefit from some fun and lightness. Kendall said by performing songs or drawing with patients he is giving what he has to give in the best possible way. He recalled surprising Brianna on her birthday by performing her favorite songs from the “Frozen’’ soundtrack. It was a profoundly meaningful moment, he said. Bucciarelli said her practice has proven art’s ability to empower, giving patients like Brianna a sense of control and humanity. Art also creates a legacy for those who leave this world too soon, a collection of tangible memories that loved ones can return to, Kendall said. Mullen recalled the Heartwood concert as a night of pure celebration. Standing with her family the night of the concert, Maria Medina said listening to Kendall sing Brianna’s lyrics makes her feel close to her daughter. Maria Medina has a photo of her daughter pinned to her sweater. Every so often she adjusts the pin, as if to ensure Brianna’s smiling face is still near her own heart. “Brianna’s voice is still being heard though this song,’’ she said. Like I said the morning hits my bed.